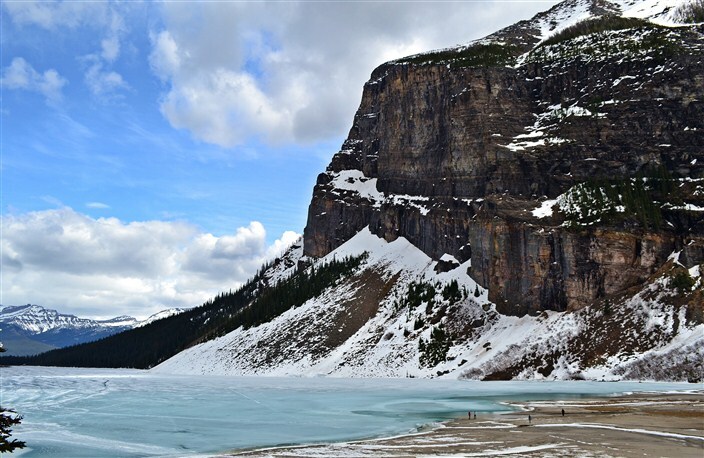 For this year’s annual Prohltravel road trip, rather than embarking on another All-American variation, we thought we’d change things up and visit our neighbors to the north in Canada, and why not, eh? 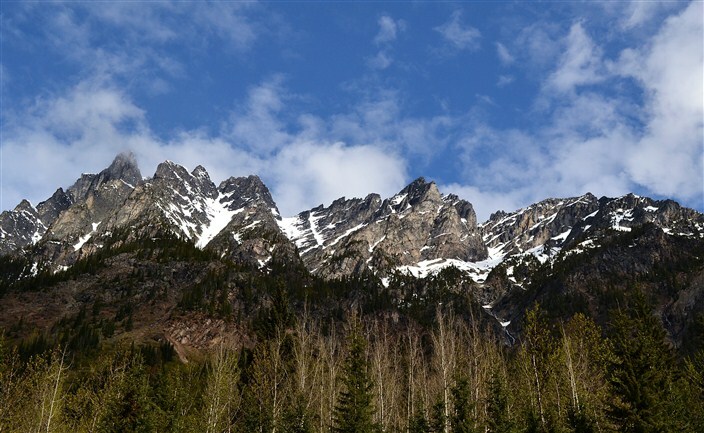 There’s some fine, friendly people up there in the Great White North, not to mention some of the world’s most spectacular and abundant mountain scenery in the National Parks of British Columbia and Alberta. Add to that an exchange rate currently in the USA’s favor and the decision was easy. They even speak English, so no translations needed. You can also brush up on your French since all the signage is required by federal law to be written in both languages. It’s an interesting experience to be an American traveling in Canada. At times it feels so much the same you nearly forget you’re in another country. As I said, you’ve got the English language. Much of the landscape is very similar, just at a higher latitude. There’s a lot of the same, ubiquitous chain stores and restaurants you’d find in any American town, i.e. McDonald’s, Walmart, etc. (although I never did figure out who this Tim Horton guy is – he’s got his name everywhere up there.) All of this can lull you into a comfort zone you’re almost unaware of, that is until you see the next road sign. Canada is still the only place I’ve ever legally driven 110. That’s 110 kilometers per hour, of course, not miles per hour. Technically, there are no speed limit signs. They say “maximum” instead. Leaving home, we crossed the border from Washington state into British Columbia under dreary, drizzly skies which remained so for the duration of that first day. 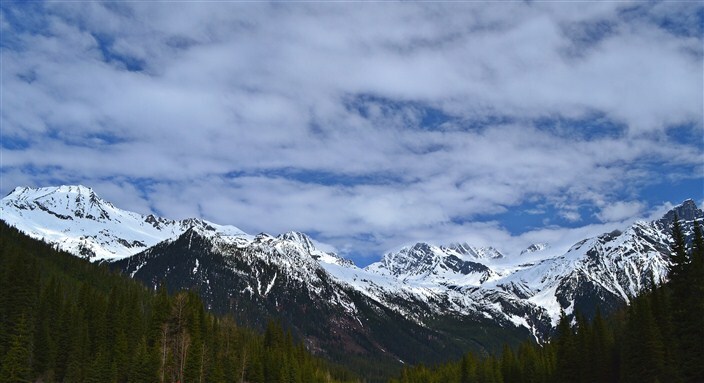 We stopped in Revelstoke, B.C. for the night, a charming small town literally surrounded on all sides by mountains. The mountains would be a recurring theme throughout the trip, but luckily, the weather improved dramatically. Next morning there were still lingering clouds but as we pushed eastward into Alberta and Banff National Park they dissipated and by our third day disappeared altogether, with the rest of our time spent under glorious blue skies and pleasant temps ranging from 15 to 23 degrees Celsius. That’s around 60 to the mid 70’s for all you Fahrenheit folks. Cold nights, however, at or near freezing. 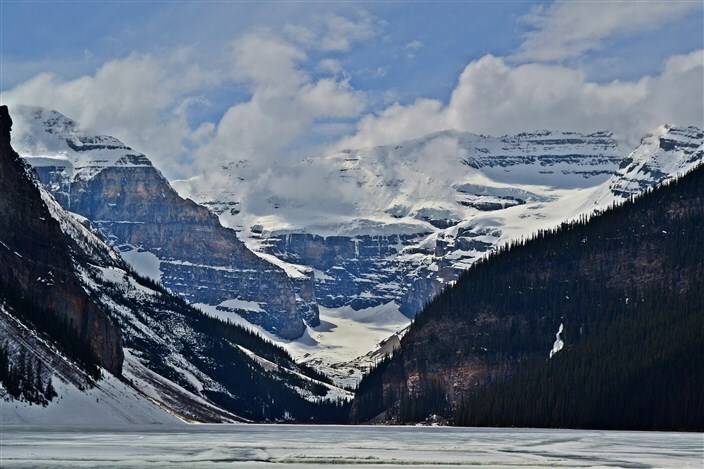 Our first major stop was at the world-famous, much-photographed and absolute must-see Lake Louise. It was midday by the time we got there, and a Sunday to boot, so we expected some crowds but not the teeming hordes which we encountered. Part of the reason we timed our visit for the middle of May was to avoid the summer tourist crush, which by all accounts is staggering. 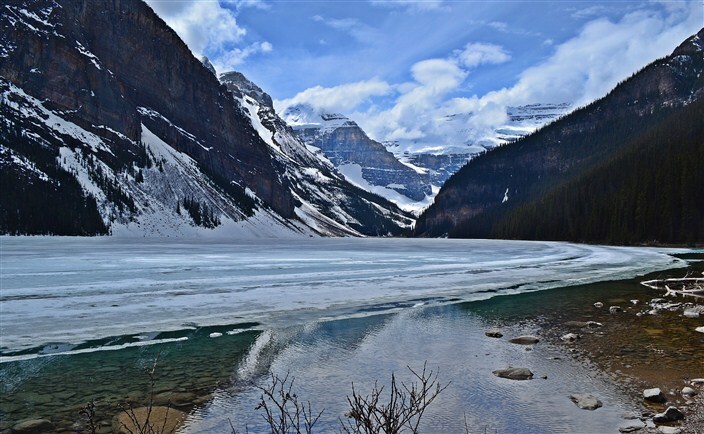 Banff and Jasper Parks host some four million visitors annually, with half that number rolling through in just the two months of July and August! After suffering through August traffic jams last summer in Yellowstone and Glacier Parks, we thought May would be a perfect time to travel the north country. Unbeknownst to us, we’d arrived on Victoria Day Weekend, a three-day National Holiday weekend that is more or less the Canadian equivalent of Memorial Day in the U.S. in the sense of kicking off the summer vacation and travel season. 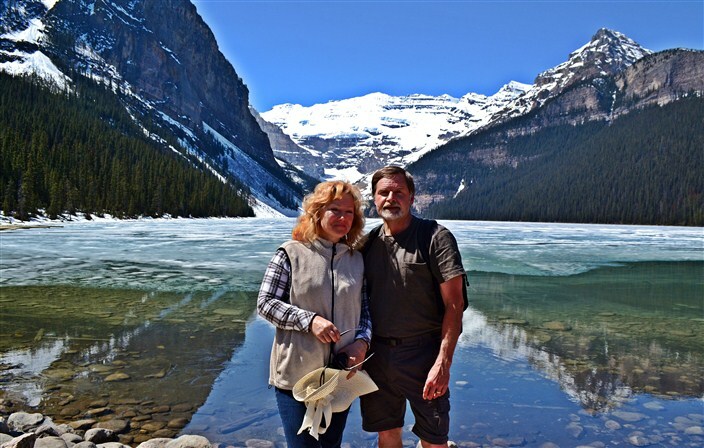 So there we were standing on the shores of Lake Louise – which was still mostly frozen over – taking our photos alongside several hundred other folks. Lake Louise itself definitely lives up to the hype, at least what we could see of it over the heads and shoulders of the bustling crowds. 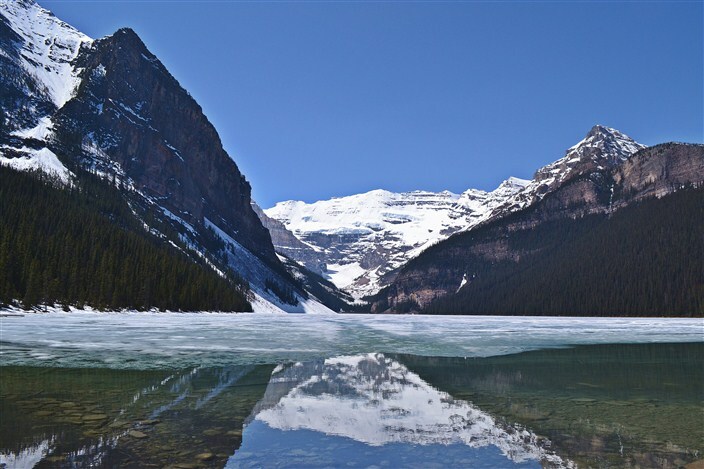 The water is clear as glass, the surrounding mountainsides and glaciers magnificent. We walked a couple of kilometers to the far end of the lake along the shoreline trail, then continued another kilometer or so into the trees. There we saw some rock climbers tempting fate as they’re wont to do, including a woman who had to be at least six months pregnant, yet there she was clambering up and down the rock face of a mountainside. Call me crazy (you wouldn’t be the first) but I think you have to be more than a little nuts to go rock climbing in the first place. Doing it when you’re that far along in a pregnancy…well, I’ll say no more. 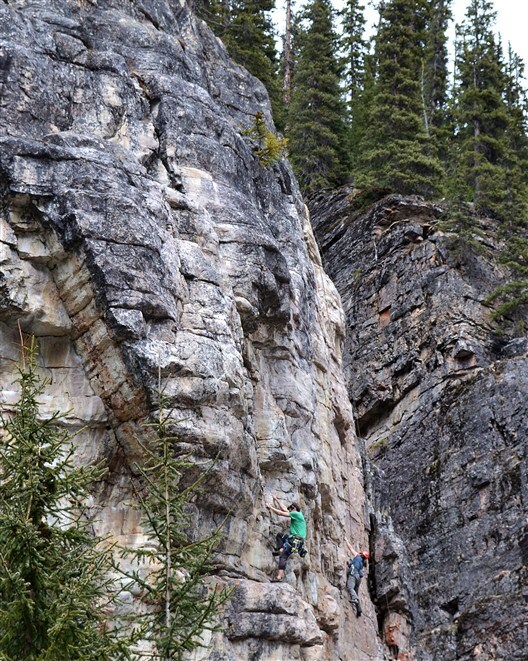 Don’t want to tick off the PLRCA (that’s the Pregnant Ladies Rock Climbing Association, Canada Division). They might impale me a on a cliff with pitons and rock hammers. 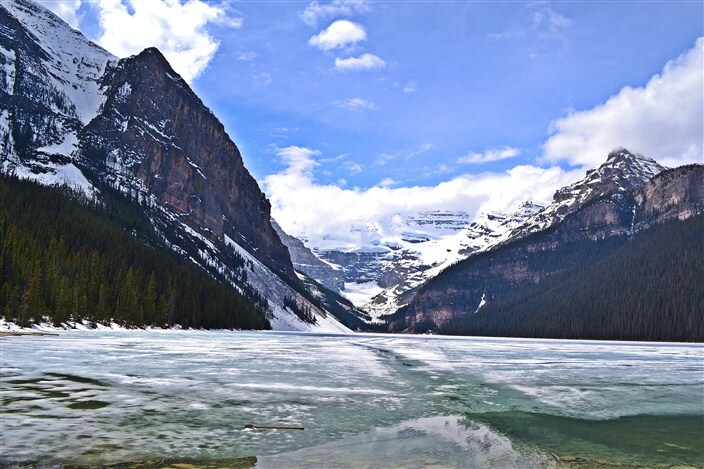 Just in case you wondered where the name originates, Lake Louise is named after the Princess Louise Caroline Alberta (1848–1939), the fourth daughter of Queen Victoria. Louise later became the wife of John Campbell, the 9th Duke of Argyll, who was the Governor General of Canada from 1878 to 1883. 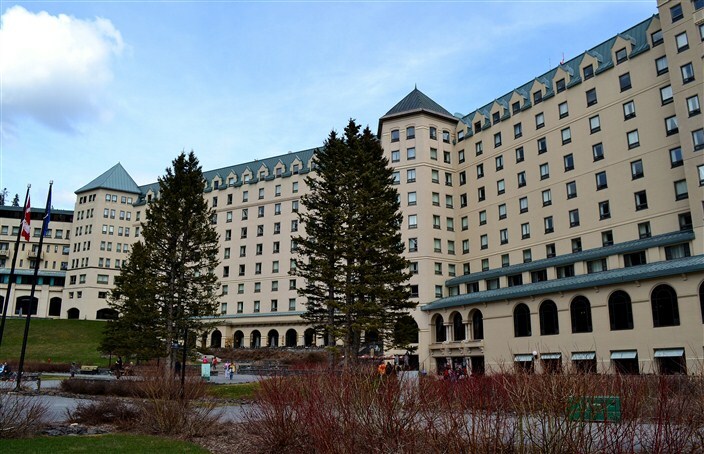 Famously situated on the lake’s eastern end is the picturesque Fairmont Chateau Lake Louise Resort, built by the Canadian Pacific Railway (CPR) as were so many of the grand hotels in western Canada, specifically to draw wealthy tourists to the area. Of course, the railway served as much more than merely a taxi service for the rich. 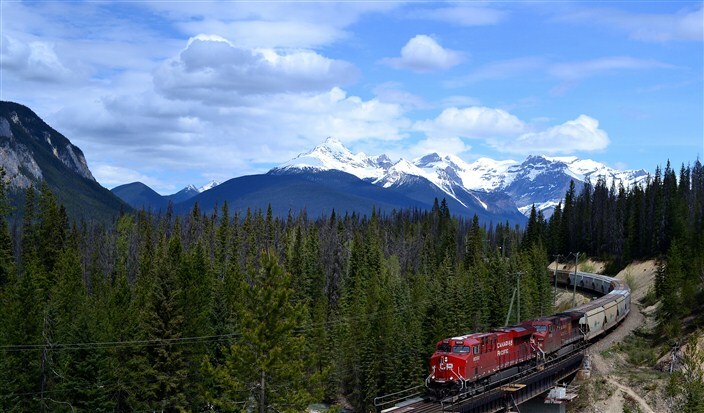 In truth the expansion of Canada into the western provinces was even more closely tied to the CPR than was the westward growth of the USA to the railways there. It’s no exaggeration to say that without the CPR as the main conduit uniting the far eastern provinces to the west coast, Canada as a country would not exist as it does today. If you can’t afford to stay at the lovely Fairmount Chateau Resort – we certainly didn’t – don’t despair too much. You can still come in and stroll around the lobby and some other parts of the hotel, snap away with your camera and take tea on the outside terrace while enjoying the view. 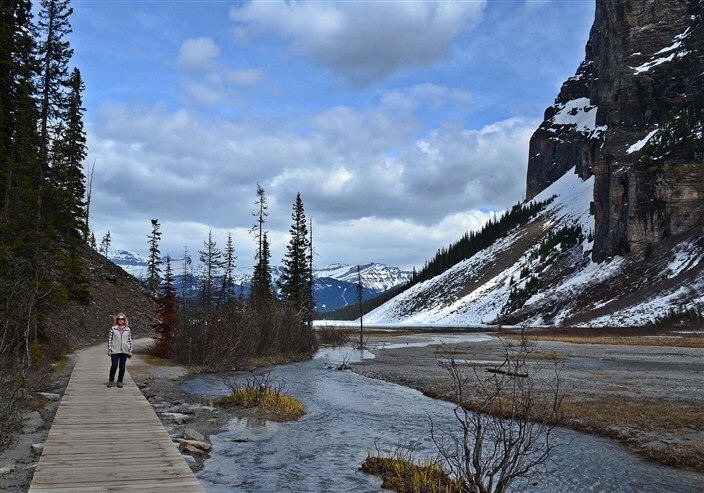 And there are plenty of other more affordable accommodations either in Lake Louise Village or Banff, less than a half hour drive away. 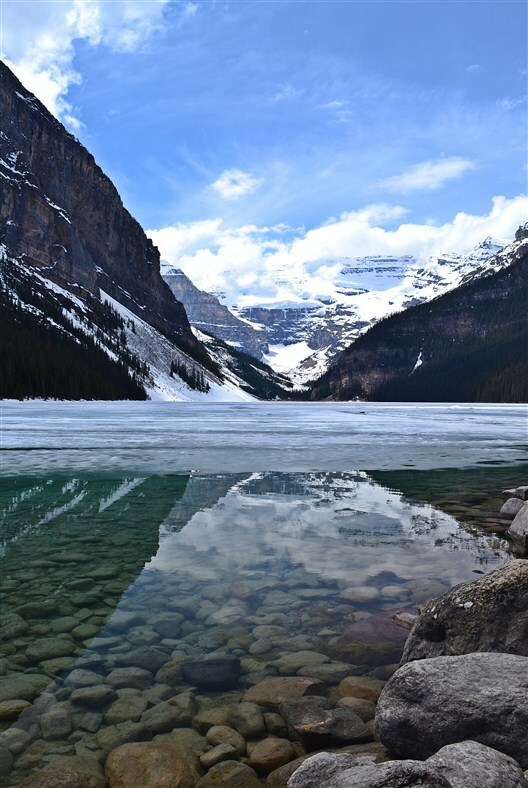 The Lake Louise area has much to offer besides the stunning scenery around the lakeshore, no matter what season of the year you visit. In late spring, summer, and early fall it serves as a jumping off point for several other hiking trails into the surrounding countryside. 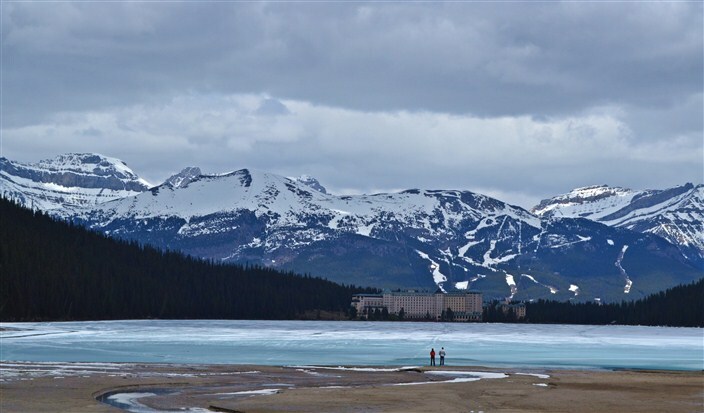 In winter it becomes a skiing destination and the frozen lake itself becomes what has to be the world’s most scenic skating and hockey rink.